It is that time of year again. I saw a Facebook post the other day that stated the four seasons of the year were, Summer, Fall, Winter and Easter. So true if you sew. So I went surfing looking for inspiration. NONE of these projects are mine. I love this first picture. She looks a lot like our princess except for the dark hair and eyelashes. I love Papo d'Anjo. So classic and fresh. Never overdone. How many of us born in the 50's have Easter photos that look just like this? I know I do. 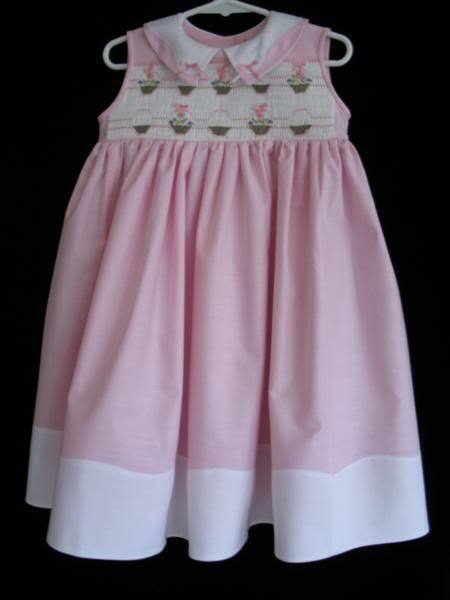 Many of my early Easter dresses came from Tiny Town, a children's shop still in business today. 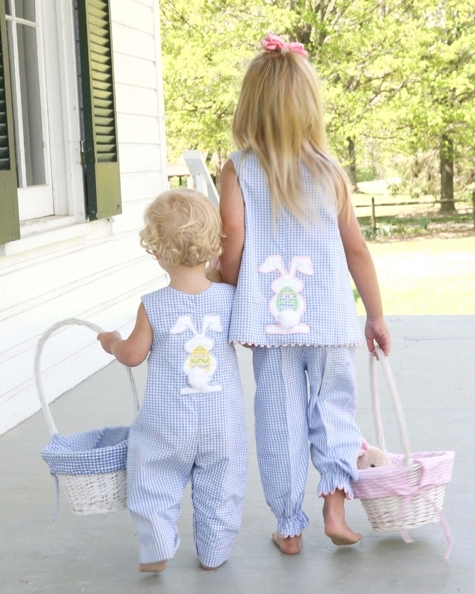 Does anything say Easter better than pastel colors and baskets? 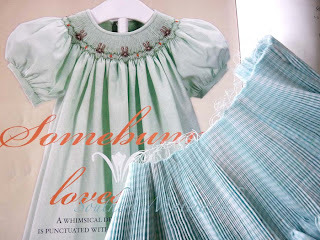 This adorable dress is done by a favorite fellow blogger, LA Sewista. Love it. How cute is this sister/brother picture? You might as well look as cute going, as you did coming! I may have posted this link before, not only is it a gorgeous dress but it is a gorgeous photo as well. This pattern has to be Martha Pullen's best seller of all time. The Heirloom Party Dress. I know I have made it more than once, as many, many others have as well. The dress pattern was first offered in the book French Hand Sewing by Machine years ago. I loaned my copy to someone and never got it back. I wonder if they have thought of reprinting this book with a new cover? and unsmocked. Just this picture is beautiful. He is a gorgeous child. This is a great blog post about a classic Easter dress. 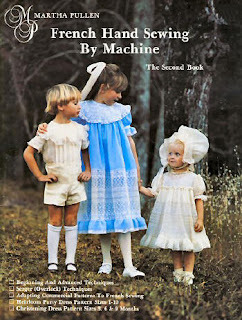 I may have to visit the Women's Exchange here to see if they still carry a version of this dress. 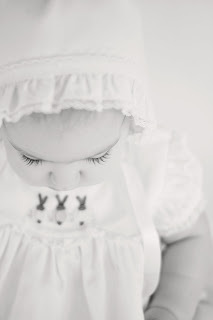 I love this dress and have a pattern for a similar one waiting for princess to be a bit older. Sounds like a nice girls day, lunch and shopping at the Women's Exchange. I hope this has gotten your creative juices flowing. I do have a bishop pleated. 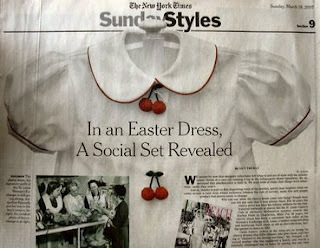 Also "planned" is a dressier Easter dress. We will see how much gets done. All beautiful inspirations. Can't wait to see yours. Thanks so much for the Easter inspiration! Don't have anyone to smock for right now but I might just have to start one "just because" it's spring! Cuteness overload! Thanks for the inspiration. I smocked the Somebunny Love bishop, in the last photograph, for my great niece last Easter. Love those little bunny faces! I think it could have used a little more backsmocking than the instructions indicated. I had a few pleats that puffed, especially after it went through the laundry. They were easily controlled with a little steam afterwards, but some extra stitching might have prevented the need. Happy Easter stitching! Love looking at the pics... since I came home to 5 feet of snow. I so wanted to call and say ship my stuff I am staying instead of boarding the plane. Thanks for all the Easter inspiration, but then you always do inspire me! I love the Somebunny Love bishop! I'm going to have to search for that smocking plate. I bought the Martha Pullen book last summer ....... same book, same photo on the cover. LOL. Why mess with a good thing! Boy, you sure know how to apply some pressure! LOL Each & every one of those outfits makes me want to get a move on. Easter will be here before we know it. 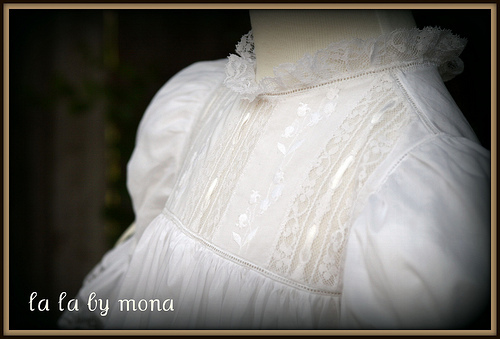 I'm actually done with the smocking & the beading on Ms. C's. Just need to construct the back bodice & skirt. 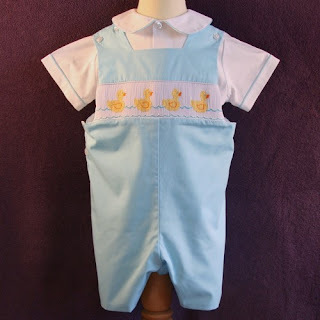 FYI, Laurie, aka SewNso has the "Cherry Dress" E-pattern available on her Brier Rabbit site. I bought it but have yet to tackle it. I better hurry up or Ms. C. will have outgrown the style. I'm honored to be among your chosen pics, Martha. Thank you. That little pink dress is one of my all time favorites. Glad you liked it. Thanks for featuring my sweet Granddaughter Journey (in the first pic)!! I enjoy your blog. My sister is Jeannie of The Old Fashioned Baby. I found your blog through hers. I love the inspiration! How the heck did you pleat that mint bishop without getting the dreaded moire effect? It's going to be gorgeous! Thank heavens for a late Easter this year! That cherry dress article was so interesting. I followed the blog post through to the NY Times archived article, but the article no longer had its photo, and now I'm wondering whether the cherries referred to were actually "yo-yos," like the article said--because in the photo in the blog post they don't look like yo-yos to me. Which is wrong, the photo, or the article? Or are the cherries yo-yos that have been gathered up all the way to make a sphere? Oh, P.S. : Although it's getting harder and harder for me to make time to sew, I still think of the sewing seasons as: Halloween, Christmas, Easter, and the 4th of July. You can also throw in St. Patrick's Day, since with a daughter with a St. Paddy's day birthday, I've done more sewing o' the green than I otherwise would have. Forgive a 3rd comment, but I answered some of my questions by doing a Google Image Search for Woman's Exchange Cherry Dress. I'm still curious whether the cherries are a fully-drawn-up yo-yo; maybe I'll have to try making one. I love the dotted version in your blog friend's post. That's the one I'd want to make.